If you live in West Texas, “spring cleaning” means something a little different to us than it does the rest of the United States. It involves much more blowing dirt finding its way under doors, through windows, and settling on every piece of patio equipment you own. But, even while you’re dealing with constantly cleaning up dirt, take some time to do a little mental and lifestyle spring cleaning. 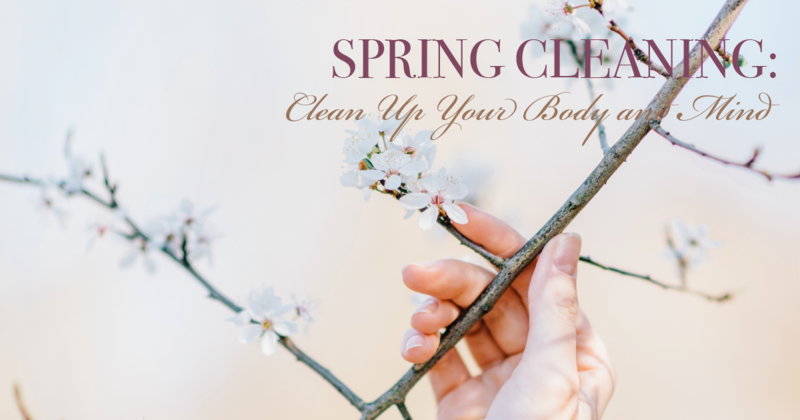 We’ve got a list below to get you started, but we’d also love to hear from you and the ways you’re cleaning up your mind, body, and attitude this Spring 2018. We all have that “leaky faucet” or “squeaky wheel” in our life that we’ve always intended to fix. Perhaps it’s a book you’ve always wanted to read or a destination you’ve always dreamed to visit. Stop putting it off! Decide what you need to do to make it happen, and start working towards that goal. Making one of your wishes come true will open up space in your mind for new dreams and accomplishments. One point to keep in mind as you’re setting your goal: set a series of small goals that lead up to the one thing you’re wanting to change or fix. If your goal is to plant a garden, it can seem pretty overwhelming to think about your ideal, big, beautiful garden in your backyard when it’s currently a patch of sun-baked grass. So instead, make a small goal to plant a few pots of your favorite flower or vegetable. By accomplishing a small part of your overall goal, you’ll be more motivated by those results to help you keep going. Don’t let that mess in the “attic” of your mind get in the way of your future success! We often trap ourselves with our own negative thoughts and regrets. Identify the negative thoughts and regrets that slow you down and process through them. Is it something you need to just let go? Do you need to apologize or make amends? Or, do you maybe just need to be a little nicer to yourself? Take control of the thoughts and worries you let invade your mental space, process them, and get them out of there! You can’t change the past, so instead, learn from it and take a new step forward in the direction you want to go. Let’s be clear though: not all thoughts have to be happy all the time; for instance, the stages of grief are an appropriate response following a loss, and they shouldn’t be ignored or rushed. Working on ourselves can be tough work even when you know it’s for the best. We recommend involving a friend or two and letting that natural community group help you through the tough points and celebrate with you during the high ones. Get out of that rut! Just because you’ve always followed one schedule doesn’t mean it always has to be that way. You have the final say on your schedule. Additionally, take a look at the way you spend your time. Would you like to increase the amount of time you spend with friends or perhaps spend more afternoons out in the garden? What is getting in the way of being able to do these things? Too much social media and Netflix? Not enough motivation? Take time to look at your day and take charge of it! We could all make changes to our eating habits for the better. This isn’t always about eating less—sometimes it’s just about getting the right nutrients to keep your body healthy and happy. Speak with your doctor about what you need for a healthy diet, and make the necessary changes to your grocery shopping. Look at this as an opportunity to eat appropriate amounts of the foods you love, and possibly discover some new favorites. Like we’ve mentioned previously, involving friends and family into your new goals can make them more fun and help your adherence as well. Everyone has to eat. Let’s meals serve as a time to spend time with friends and family without having to add an extra event to your calendar. Feeling more ambitious? Start a dinner club and take turns reinventing some of your favorite dishes into a healthier version of themselves, like this Low-Cal Fettuccine Alfredo. Donating items to a local charity is fantastic. You might also be surprised to learn the difference just volunteering your time can make as well. Giving of yourself and your time works wonders for them and you. Contact local charities you’d like to be involved with and find out what they need. Need some help finding the right fit? Volunteer Lubbock’s website could be a good place to start. Also, keep in mind that volunteering doesn’t have to be complicated or complex. Start with the places and people you already know. Help a neighbor mow their yard, make meals for friends who are in a tough spot, assist your local church by simply asking “what do you need?”. You’ll find plenty of ways to make a difference with your unique set of skills and personality.